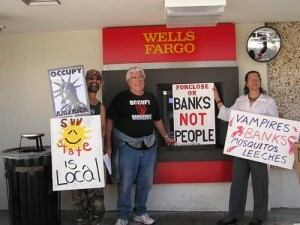 Occupy Gainesville protests outside of Wells Fargo in Downtown Gainesville. Photo by Mary Bahr. You may have seen the Gainesville Vets for Peace Cost of War program. It gives the cost of war to our local community and to the state of Florida, as well as the national costs in blood and taxes. The data is derived from the National Priorities Project Cost of War project at www.costofwar.com. These pages will give you the cost in tax dollars on counters that change every second and will also offer tradeoffs (what those dollars could have bought in our domestic economy had we not spent them on war). Even with troops withdrawing from Iraq, many troops and support personnel will be left behind. We still have to pay the costs of equipment replacement and health care, which are projected to total a trillion dollars each. And then there’s still Afghanistan. 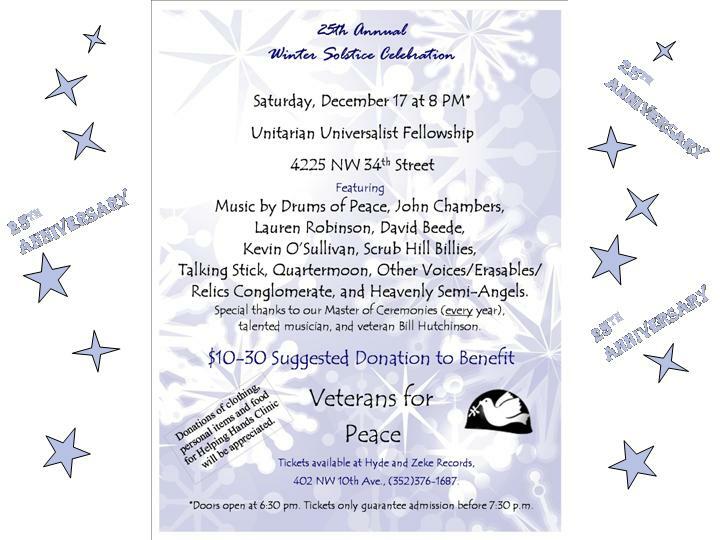 Gainesville Veterans for Peace will be hosting its 25th Annual Winter Solstice Concert on Saturday, Dec. 17. For a quarter century now, the anti-war group has been bringing together peace musicians, artists, organizations and advocates at a concert celebrating the Winter Solstice. This year’s line-up includes Drums of Peace, John Chambers, Lauren Robinson, David Beede, Kevin O’Sullivan, Scrub Hill Billies, Talking Stick, Quartermoon, the Heavenly Semi-Angels and others. 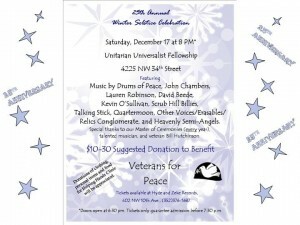 The Winter Solstice Concert will be held at the Unitarian Universalist Fellowship (4225 NW 34th St.). Doors open at 7p.m., and the concert begins at 8p.m. Tickets are $10 to $30 on a sliding scale. Advanced tickets can be purchased at Hyde & Zeke Records (402 NW 10th Ave.) or by calling (352) 375-2563. People who purchase tickets in advance must arrive by 7:30p.m. to assure a seat. Unclaimed seats will be opened up for those in line after 7:30p.m., with no preference given to advance ticket purchasers, until all 400 seats are filled. Outside the event, organizations and groups from the Gainesville area will set up informational booths and tables. Attendees are encouraged to bring clothing, food and personal items to be collected and distributed by Helping Hands Clinic. Refreshments will also be available. Parking is available at the event but is limited (carpooling recommended! ), and parking attendants will be present to assist drivers. For more information about the Winter Solstice Celebration, visit the Vets for Peace Website.